Chalkhills: Reviews of "Rag & Bone Buffet"
Compilations of rare music do one of two things for a band: focus on either the good or the bad. With a group as consistently solid as XTC, you know that it can only be the former. Rag And Bone Buffet brings together songs from across their entire career, reaching all the way back to 1978 on 'Looking For Footprints.' Some old hits - 'Ten Feet Tall' and 'Respectable Street' - lure in those looking for an alternative glimpse at past memories, but true XTC fans will have quite a bit of new stuff to add to the palate. 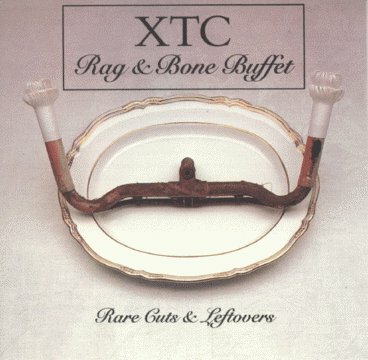 XTC's "Rag & Bone Buffet" isn't a "Greatest Hits" package per se, but with wonderfully quirky songcrafters like XTC, their "leftovers" are often more fun than any "Greatest Hits" package can be, making this collection a must-have for anyone interested in finding the true rough-edged soul of the band. Like R.E.M. 's "Dead Letter Office," this is a collection of spin-offs, alternate takes and B-Sides, that never saw the light of radio, but have put many a smile on the face of devotees like myself who previously had to spend a load of time and cash in finding them. Subtitled "Rare Cuts and Leftovers," "Buffet" includes such tasty treats as "The Three Wise Men's" "Thanks For Christmas," by far the best new-wave Christmas tune (sorry, Waitresses fans! ), written by the same guy who wrote "Dear God." BBC versions of "Another Satellite" and "Scissor Man" provide stark readings when compared to their album version counterparts, and there are B-Sides galore that other lesser bands would be proud to call singles. A feast of fun that's actually filling despite its leftover status. Like all compilations of rare cuts and B-sides, this album has its ups and downs. The Todd Rundgren-produced "Extrovert" beats anything XTC did with him on Skylarking by a mile, and other tracks like "Tissue Tigers" and "Scissor Man" show conclusively why the jagged tense rhythms and hyperactive songwriting of Colin Moulding and Andy Partridge have brought XTC a growing base of fans for the past decade. However, it's pretty obvious why the boring "I Need Protection" didn't make it onto any finished products, and while the two Christmas tracks are kind of neat, they pale in comparison to the furious energy of a cut like "Strange Tales, Strange Tails." The un-initiated should look back to the White Music or Black Sea LP's before picking this up, but Rag & Bone Buffet is a must for all XTC fans. 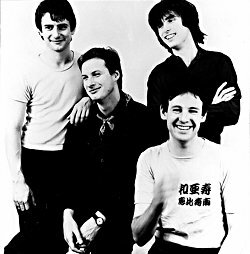 XTC circa 1980: Scraps from the past on Buffet. Recycling may be a fashionable idea, but it isn't a new one. Grandma and Grandpa remember the old paper drives, while across the ocean in England the rag and bone man, who collected bits of clothes and bones to be resold, was long a familiar figure. Recycling has a long history in the music business as well, and in keeping with that tradition, British avant-popmeisters XTC have just released Rag 'N' Bone Buffet (Geffen). The album serves up scraps from a decade's worth of XTC exertions. Like any pick through the garbage heap, it offers both surprising and valuable discoveries and outright trash. But when the band is as witty and inventive as this one, even the throwaways have a certain charm. Included in the Buffet are 24 B-sides, alternate takes, tracks that never quite made it onto an album and other oddities. "Looking for Footprints," the oldest song in the set (1978), was originally recorded for but never appeared on the band's second album, Go 2. "Mermaid Smiling" was briefly on the Skylarking album, but when the B-side, "Dear God," became a left-field hit, the "Mermaid" had to make way for "God" in subsequent pressings. An electric version of one of the band's first hits, "Ten Feet Tall"; a dub version of "Roads Girdle the Globe"; a live performance of "Scissor Man"; and a vocal version of "Happy Families," which made a cameo appearance as an instrumental on the radio in the film She's Having a Baby, are among the tracks that have been saved from the dustbin of musical history. Speaking of history, the set concludes with a clever little number called "History of Rock 'N' Roll," which wittily and quite successfully summarizes four decades of rock in all of 19 seconds. Rag 'N' Bone Buffet is the 11th U.S. release for XTC and comes on the heels of a feast of reissues. Geffen recently brought out the band's first five albums (White Music, Go 2, Drums and Wires, Black Sea, Mummer) on CD and added bonus tracks not on the original albums to each.